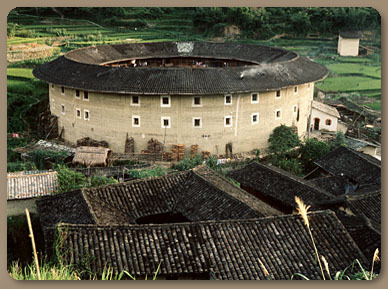 A large communal dwelling in Hekeng, a Hakka village in Fujian. Called Tu Lou, buildings like these - very likely the only communal rural apartment buildings in the world - can measure up to 100 yards in diameter and house up to 700 people under the same roof. There are three main building forms: round (Yuan Lou), square and 'Phoenix' Tu Lou.